From her home and cafés in Mexico City, María Salguero is filling in the gaps left by official data on gender-related killings. 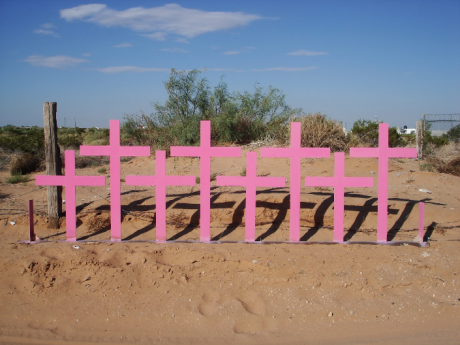 Pink crosses mark the site where eight women's bodies were found in Ciudad Juárez, Mexico. Photo: Wikimedia Commons/Iose. CC BY-SA 3.0. Some rights reserved. Whenever María Salguero, 40, has a moment to herself, she sifts through her Google Alerts and the local news in Mexico for reports of femicides. This unusual pastime began in 2016 when Salguero, a human rights activist and geophysical engineer by training, decided to build a map tracking cases of femicide, and filling in the gaps left by official data, in her spare time. Femicide (also referred to as feminicide) is the deliberate killing of a woman or girl because of their gender. UN Women, the United Nations’ gender equality organisation, notes that these gender-related murders may follow other violent acts including domestic abuse, describing the context in Latin America as one of “high tolerance” towards such “normalised” attacks. In a café in central Mexico City earlier this year, Salguero told me that she “had already worked on a map of people who are disappeared [in Mexico]”, referring to the tens of thousands of missing women, men and children in the country, believed to have been abducted and likely tortured or killed. In 2018, the government’s own figures counted more than 37,000 ‘desaparecidos’. While working on this map, Salguero said, she “noticed that there were more and more articles about women who were being murdered”. Around the same time, some of her friends, who are journalists, told her that they were having trouble quantifying and tracking the number of femicides. “Building a database is not that hard, nor is georeferencing it, I told them… I started my own”, Salguero explained. Over the last two years, her work has had a significant impact. Mexico’s mainstream press has cited her data, for example. She has also been invited to the states of Quintana Roo, Michoacán and Zacatecas to present her findings to local governments. Recently, El Universal, one of Mexico’s most important national papers, described Salguero’s project as “an important source to consult that contrasts with official figures, which try to minimise the problem” of gender-based killings. Projects like these, based on aggregating news reports, are “so important,” added Carolina Torreblanca, director of data analysis at the civil society group Data Cívica, in Mexico City, because they “give the context surrounding the femicide” which “official data does not provide”. Opening her laptop in the café, Salguero gave me a tour of her colour-coded map, the information it brings together, and how she categorises cases. Hovering over different cities and regions in Mexico are red circles of varying sizes, indicating how many cases of femicide she has recorded. When she updates the map, Salguero adds as much detail as she can. Where possible, she links the cases on the map to profiles including names of victims (if available), their ages, how they were murdered and by whom. She also includes links to local media articles. When this information is available, she also details the crime scene (where the victim’s body was first found) and if the femicide left children orphaned. Screenshot of Salguero’s map, taken on 4 December 2018. Salguero has now recorded and mapped more than 6,000 cases of femicide dating back to 2011. In 27 cases, authorities were unable to establish the woman’s identity. In 70 cases, the victim was a trans woman. In one case uploaded to the map, a woman’s body was found floating in a water tank in Guanajuato state, central Mexico, on 18 July 2018. The 30-year-old woman, identified in media reports only by her first name María Guadalupe, had been shot and was found by a pastor who alerted police. The various filters Salguero has created to categorise the cases on her map reflect dark realities about femicide in Mexico and impunity more generally. Under her category “status of the person who committed femicide”, she’s recorded convictions in only 128 cases. More than 4,000 perpetrators were listed as fugitives when I last checked the map, in early December 2018. In October 2018, Mexicans were shocked by news of a couple who admitted to having murdered more than 20 women in Ecatepec, a suburb north-east of Mexico City (the country's most dangerous municipality for women). This case catapulted the subject of femicide into the national spotlight once more, with the local press dubbing the couple the “monsters of Ecatepec”. The sparse, international data that does exist on femicides suggests they are rampant in Latin America and the Caribbean, with the region accounting for 14 of the top 25 countries with the highest estimated rates of these killings. In Mexico, an average of nine women are believed to be murdered every day, according to UN Women’s latest figures released in November 2018. The country's criminal code does specifically reference femicides, defining the crime as one “that deprives a woman of her life for gendered reasons”, evidence of which include signs of sexual violence; “degrading” injuries; a history of violence at home, work or school. But there are significant gaps in official data on these gender-related killings. The information that Salguero has compiled highlights these. She gave me an example: Quéretaro, a conservative state in central Mexico, has one of the lowest rates of femicide in the country according to National Institute for Statistics data. This year, no femicides have been officially recorded there – while she has found and logged at least five cases. 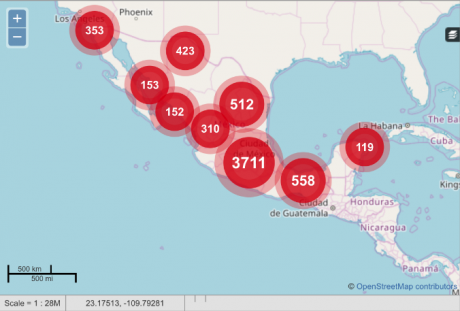 Torreblanca, the director of data analysis at Data Cívica, recently published an article on how femicide is counted in Mexico. She warns that there are issues with all data on femicide that must be acknowledged. Data produced by projects like Salguero’s, which are based on news reports, do not reflect the exact number of femicides, but rather “the probability that a femicide is reported in the press”, Torreblanca told me. And this may depend on many factors, for example: where the crime took place; if the woman is indigenous; if the woman is white and privileged. Meanwhile, Torreblanca added, authorities’ official data on cases they considered femicides is also produced in an “opaque way”. What is considered a femicide differs between states and has changed over time. What authorities considered a femicide in 2015 may not be the same as what they consider a femicide in 2018. “This makes it hard to measure how much the phenomenon has evolved using official data”, she explained. Many cases haunt Salguero. On 8 June 2017, for instance, 11-year-old Valeria didn’t get off the bus at the stop where her father and his partner were waiting for her, on a street in Nezahualcóyotl, east of Mexico City. Usually, they’d pick Valeria up from school and cycle home together. That day, it was raining and she was put on a bus with strict instructions on when to get off. Her body was found the next day in the passenger seat of the bus, which had been abandoned. She’d been sexually assaulted and murdered. Salguero shudders as she recalls Valeria’s case. “Girls are so vulnerable”, she said. Reading about this femicide in the news “was very disturbing". Working on such a violent topic is hard, Salguero continues, explaining that when things get too much, she hops on her bike and rides through the city. “It has helped make sure I don’t go crazy”, she admits.